The SunAir: Lateral arm awning, available in manual or motorized control. Provides shade when you need it and sun when you want it. Available in over 200 patterns and colors. Great for business or residential use in standard and extra large sizes for bigger patios. 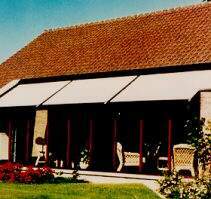 All-Weather retractable awning designed to withstand rain, sun and other elements. 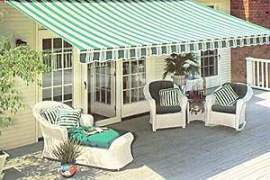 Designed especially for sunrooms, greenhouses and patios to protect against intense heat on sunny days. Motor operated and completely self-storing with its own hood and cassette. All of our awnings are available with optional Somfy motors. Select from outdoor plugin systems that require no electrician, decorator toggle switches, or the Somfy-matic automatic sun and wind control for the ultimate in protection and convenience. 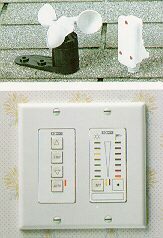 Includes manual override to insure total control during power outages and 5-year warranty. Features and Benefits - See how your family or business can benefit from the unique features and quality of the SunAir line of awnings. 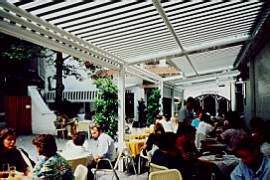 About the SunAir Company - Find out what makes this line of awnings the best in the industry. Free Quote for Your Awnings - Get a free estimate from our highly knowledgeable sales representatives for your awning project.